Review: The book, Two Moon Princess, is a flawless book. Carmen Ferreiro-Esteban did an outstanding job writing this book. Andrea, the main character, is not who you would think of when you want a young princess. Instead, she is a princess who doesn’t want to be what everyone else wants her to be. If you read this book, you will stay with Andrea through her attention-grabbing life. Andrea is a daring young princess who just wants to be herself. She wants to be a brave knight. She has proven to the kingdom that she has the strength by winning the archery tournament. She has the courage to become whatever her heart wants, but there is something in her way, her father. However, her father, the king of the kingdom, wants her to be like her other sisters and become a proper young lady. Andrea is furious! All she ever wanted is to be a brave knight, and her father hates it! Later that night, Andrea runs away. On her journey to another island, she finds a flaw in her plain. The way to the island is far too dangerous for a little girl to face by herself. But that doesn’t stop Andrea. She goes for it anyway. When she gets there, she regrets it. She slips down a cliff, but thankfully, her dress that her dad makes her wear, saves her life. It gets caught on a nearby branch. Holding on for dear life, her uncle, the only person Andrea really trusts, saves her. He pulls her up off the cliff. Lovingly, her uncle makes her a deal, if she doesn’t run away ever again and respects her mother while she is teaching Andrea how to be a lady, he would teach her more about archery. For the love of the sport, Andrea makes the deal. The two of them ride back to the castle. The next day, Andrea shows up at the lessons like her other sisters, but doesn’t like it. Does Andrea keep her promise? This was one of the best books I have ever read. I personally love how the author mixes a girly theme with a boyish theme. I could never put this book down; all I did was keep turning the pages. I cannot wait for the sequel to come out. This book did have its ups and downs, but even the downs were still interesting. I give this book a five out of five star rating. I barley found things that I couldn’t understand. I consider any person that believes that they can be whoever they want instead of who people want them to be should read this jaw-opening book. This book is filled with suspense, drama, passion, love, and much more. That’s why it is such a great book. We would like to thank Raab Associates, Inc. for providing a copy of Two Moon Princess for this review. 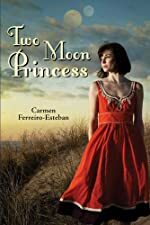 Have you read Two Moon Princess? How would you rate it?